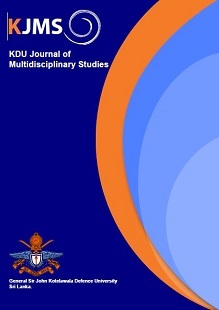 The KDU Journal of Multidisciplinary studies (KJMS) is published biannually, in March and in September by the General Sir John Kotelawala Defence University, Sri Lanka. KJMS is an international open access and peer reviewed journal to publish high quality original research papers from different disciplines and interdisciplinary approaches. The journal opens to researchers of diverse disciplines on Medical and Health Sciences, Life Sciences, Physical Sciences, Architecture and Spatial Sciences Engineering, Social Sciences & Humanities, Defence Studies, Law, Management, and Computing etc. The author guidelines are published in http://lms.kdu.ac.lk/kjms/index.php and authors shall use the live template downloadable from KJMS link to prepare the manuscript. KJMS adopts a double blind peer review process to ensure the quality of publications and to avoid plagiarism. All papers in KJMS are edited electronically. Authors have to register in KJMS website for online submission of the journal papers. The manuscripts that fulfill the criteria of the journal will be sent to two referees with the required subject expertise decided by the editorial board for double blind peer review. Based on the comments and the recommendations of the two referees, the Editor-in-Chief in consultation with the editorial board has the right to decide whether the paper should be accepted as it is, or resubmitted with revisions, or rejected. The decision will be conveyed to the authors. Editor(s), Author(s), and specialized proof readers are included in proof reading and finalizing the manuscript for inclusion in the volume. Editor of the manuscript assigns the manuscript to a planned volume of KJMS. Once the volume is ready, it is published online. Print version is edited and published through a separate process following e-publishing of the volume. Focus of this journal is to encourage researchers to publish research papers in a multidisciplinary platform cutting cross boundaries in various disciplines. Multidisciplinary studies for betterment of life.